I have heard from quite a few of you that are wanting to see more one-dish and crockpot meals, especially since fall is coming up. First off, I am right there with you! Back to school time has me craving more pumpkin scented candles & warm, hearty foods. If you are feeling in the mood for fall, or searching for something new to try out in your slow cooker, this recipe is it. 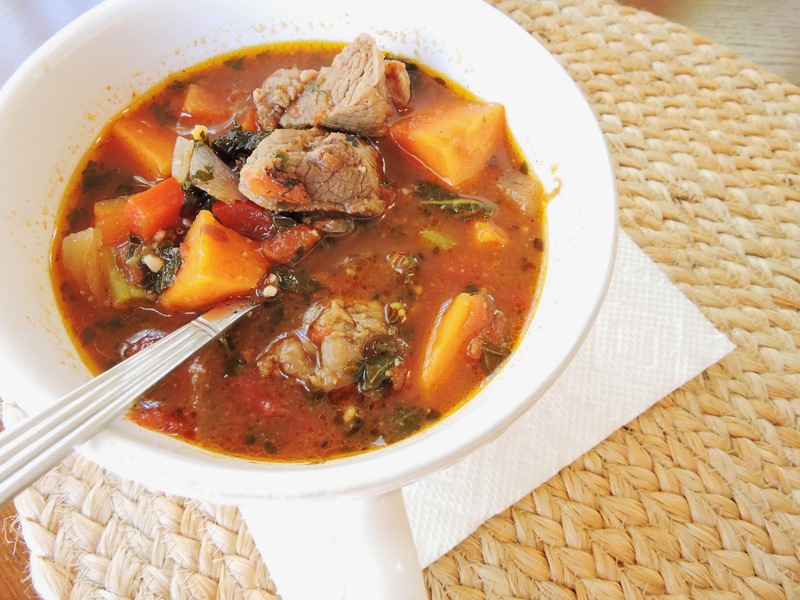 This stew is filled with tender-crisp vegetables (which can sometimes be tricky in the crockpot...), rich broth, and hearty beef. 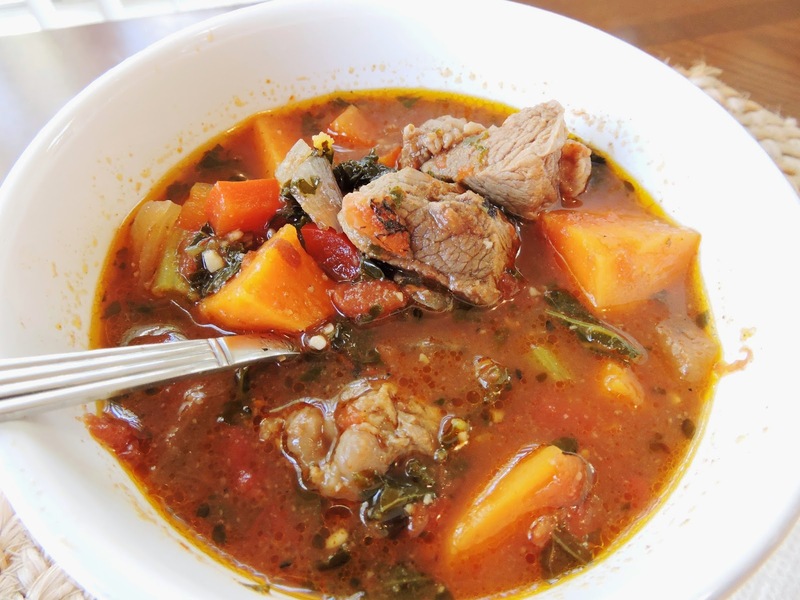 The tomato, sweet potatoes, and bell pepper add to the sweet flavor profile, while the beef broth, garlic, and spices keep it savory. A little heat is added through the addition of diced green chiles, and hot sauce if you want it extra spicy. Transfer the meat to a slow cooker, and add all remaining ingredients, except for the red bell pepper and kale (save those until the end). Serve warm, topped with hot sauce and avocado if you'd like! *I like adding the kale and bell pepper at the end so that they stay bright & colorful with a bit of crunch, and don't get too soft. You can add them at the beginning if you'd like! This looks really good and I love crockpot meals! Also, THANK YOU SO MUCH for the lemon larabar recipe!! Tasted JUST LIKE the real deal!! Love it!! OMG! This was so good. Probably my favorite paleo crock pot meal so far. It was super easy to prepare and was absolutely delicious. I will most definitely be making this again. Even my co-workers were jealous when they smelled my lunch. You might have a few more followers the next few days! Thanks! I'm on here to review the ingredients so I can make this again. It was delicious. Thank you! The color of the dish is so bright.